TAKE 71 NORTH TO 90 EAST. EXIT AT THE EDDY ROAD / BRATENAHL EXIT (#178). TURN RIGHT ONTO EDDY ROAD (TRAVELING SOUTH) TO THE FIRST STREET ON THE LEFT WHICH IS TAFT AVE. (TAFT IS IMMEDIATELY AFTER THE ONLY INDUSTRIAL BUILDING ON THE LEFT AND BEFORE THE RESIDENTIAL AREA BEGINS. IF YOU MAKE IT TO THE FIRST TRAFFIC LIGHT ON EDDY, YOU’VE TRAVELED TOO FAR). 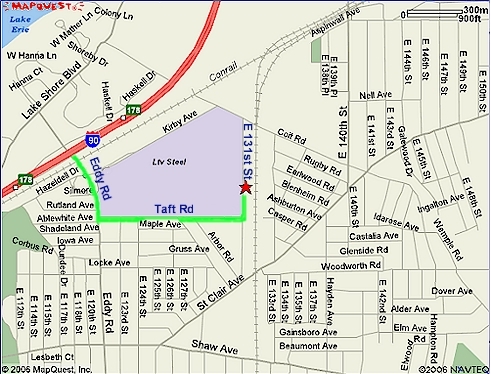 TURN LEFT ONTO TAFT (TRAVELING EAST) FOR APPROXIMATELY 5 BLOCKS, TO THE STOP SIGN WHICH DEAD ENDS INTO E. 131ST STREET. TURN LEFT ONTO E. 131ST (TRAVELING NORTH). WE ARE THE SECOND BUILDING ON THE RIGHT (EAST SIDE) AT 275 E. 131ST. AUTOMOBILE PARKING IS IN FRONT AND THE ENTRANCE IS IN THE FRONT / MIDDLE OF THE BUILDING.